Patient education is often understood to be the imparting of knowledge from the healthcare professional (HCP) to the patient and/or their caregiver. However, in most cases, the imparting of knowledge is not enough. True patient education can be described as “The process by which the patient comes to comprehend his or her condition and self-care”. So, instead of just passing on information, for education to actually take place there needs to be comprehension, understanding and arguably motivation for patients to take notice and take action that improves their own health situation. To effectively educate patients, patient engagement with their healthcare situation is the HCP’s first challenge. The challenge is inherently complex because every patient, their circumstances and attitude to their healthcare situation is unique. One aspect of difference amongst patients is highlighted by Rotter’s (1966) model which covers the “locus of control”. The diagram below gives an indication of the types of beliefs that a patient may have which determine whether their locus of control is internal or external. Of course, patients do not fall simply into one of the two categories, their beliefs may place them anywhere on the scale of the two extremes. Naturally, a more internal locus of control makes it easier for the HCP to engage with the patient as they are more likely to be positive about taking on responsibility and action to make improvements to their own health. However, patients with a more external locus of control may believe that their condition is out of their control and that nothing they do will make a difference. Patients with these beliefs are far more difficult to engage but it is possible to shift their attitudes, and this is a key goal of the HCP. Engaging patients with their condition can be a hurdle but once overcome the opportunity for patient education is available. Education can support patients to fully understand their individual healthcare situation, so they are well placed to take joint responsibility and make decisions together with their HCP. Firstly, the patient starts to ‘activate’. As they gain a sense of control and ownership for their condition they are more likely to make positive choices that impact on their health. Patient activation is defined by the National Health Service as “The knowledge, skills and confidence a person has in managing their own health and care.” Patients are motivated because they understand the impact they can have and how their quality of life can be improved. At this point, medication adherence is likely to increase, complications reduce, and patient progress enhance. Secondly, the NHS is also set to benefit. Due to better medication adherence, self-management, self-monitoring of their condition and positive lifestyle choices, patient appointments are likely to be fewer as problems are reduced and patient progress enhanced. Improved patient progress reduces cost, time and resources required from the NHS. A study found that less activated patients had 8 percent higher costs in the base year and 21 percent higher costs in the following year than more activated patients. At a time of increasing strain on the NHS, patient activation is more important than ever. 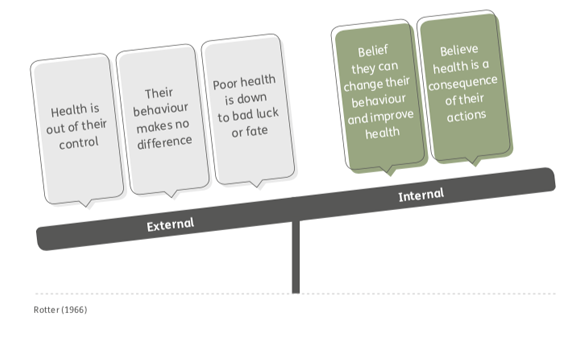 The elements in the model influence the likelihood of the acceptance and application of health behaviours by the patient. The individual’s behaviour depends on the value that he or she places on an outcome and on the individual’s estimate that a particular action will result in that outcome. 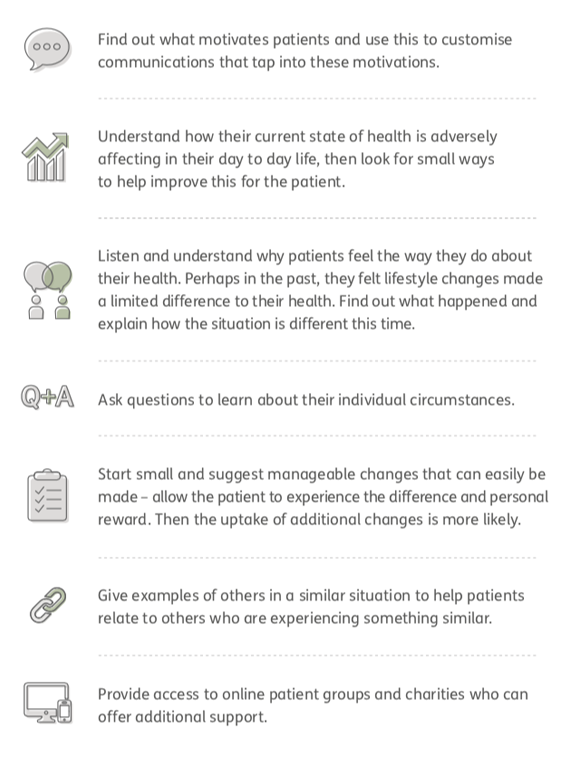 The HCPs challenge is to engage patients by focusing on outcomes that relate to their personal priorities and circumstances. By relating outcomes to the individual, there is an increased chance that patients will be motivated to take action. This requires significant communication skill on the part of the HCP to build an open and trusted relationship with their patients. This relationship can enable not only patient activation but patient participation in the decision-making process around their treatment options, further reducing barriers to non-adherence. Hochbaum’s Health Belief Model dates back to the 1950’s and Rotter’s Locus of Control, the 1960’s, so it seems that the ideas around patient engagement and education are nothing new. To effectively engage patients with their health and educate them to the point of activation needs time though, something that we often hear HCPs are short of as our health service in the UK is stretched to the limit. Time is not the only barrier though, lack of communication skill is even more of an inhibitor. A human communication approach appropriate for the individual and uses the patient’s language is critical. Taking a longer-term view, increased investment of time and quality of communication with patients leads to much less investment in time and resources later down the line, ultimately resulting in overall costs savings. At Cuttsy+Cuttsy we recognise not only the need to better support patients but also the need to better support HCPs, so they can support their patients. We work with pharma and charities to develop communications and support materials to aid the engagement, education and activation of patients throughout their healthcare journeys. 5. Hochbaum, G.M. (1958), Public participation in medical screening programs: A sociopsychological study.PHS Publication No. 572. Washington, DC: Government Printing Office.